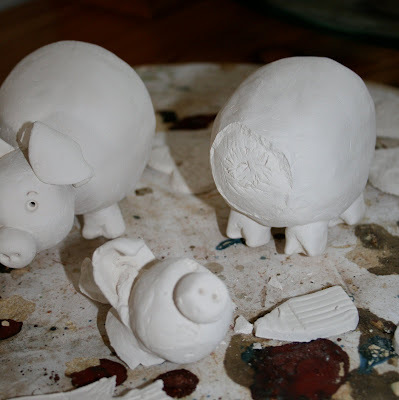 Joharo at home: Oh Piggies......! Oh no ... poor Mrs P.Ig... she really looks like she's been fired at and her head has popped off in fright!!!! "Don't worry though" was Claire's comment... "we can fix this"! I think a small miracle is needed here! Here are my finished pieces... I can't wait to see what they will look like when they are fired again... I'm hoping the colours will be bright and zingy! 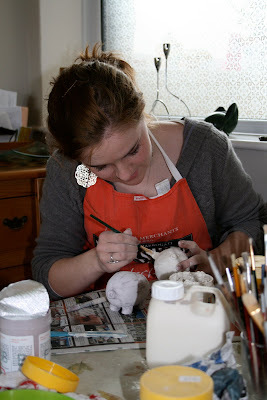 Harriet had the job of painting Mr and Mrs P.Ig..... Mrs P.Ig was painted in her various pieces... I think the plan is to stick her together once she has been fired again and maybe covering up the join with a lovely big ribbon! 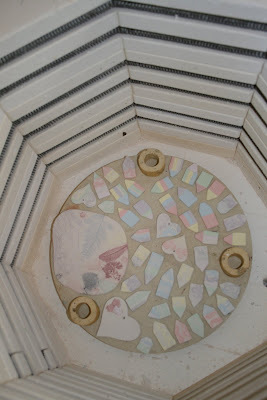 Little houses ... all bright and beautiful..
... and here they are, in the kiln, waiting for the heat... bring it on! These hearts are gong to look amazing. 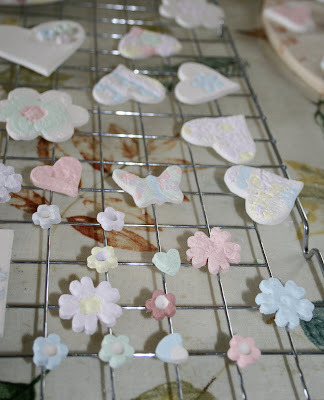 They have glaze around the edges and the centres are filled with crushed glass... the colours are FAB... I can't wait to see what they will look like once they have been fired and the glass has all melted and melded with the glaze. Hope you are enjoying the sun today... it's so lovely to have the warmth on my skin again... it's been far too long! Poor Mrs P.Ig! Hope she comes together at the last minute. What fun it looks like you have all had. Cant wait to see how all your work has turned out. Yes its been so lovely to see the sun this week. Although i am still sooo cold!